On my recent trip to Santa Barbara, my friend and I stopped in Cambria to get lunch and visit a wine shop there. 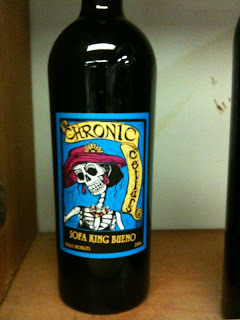 In the deli, we saw some interesting and new labels...one of which is this one: Chronic Cellars. My first thought when I saw this was - how the heckfire did they get this past the TTB??? Hilarious.